FAULKNER STREET CHINATOWN is seen here, with the Chinese Arch in the centre right. This district was once earmarked for a redevelopment plan in which all the old warehouses would have been pulled down to make way for a series of office and leisure developments similar to Piccadilly Plaza, stretching from Piccadilly to Oxford Road. The plan was never implemented and in the meantime, the old warehouses, with their atmospheric back alleyways like Kowloon in miniature, became a piece of China in the heart of Manchester. Chinatown is now one of city centre Manchester's main nighttime attractions, and is a Chinese cultural and residential district too. MANCHESTER CENTRAL LIBRARY looks magnificent in floodlighting since its exterior cleaning job in 1999. During weekdays, the main library is open until 8pm - the building is also open at night to allow access to the Library Theatre, (formerly the Intimate Theatre), located in the basement. An all night event was held in Autumn 1997, with tours of the stacks - said to be haunted - in the early hours of the morning. It would be great if the Library were open 24 hours a day, but I'm not sure if the Library staff would agree with me. 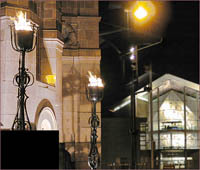 THE BRIDGEWATER HALL is regarded by many as Manchester's jewel in the crown, as far as cultural amenities are concerned. It's an impressive building - especially at night, when the front lobbies are lit up and visible through the exterior curtain windows - concert goers can be seen silhouetted against the light. But it's not the Sydney Opera House or the Bilbao Guggenheim - Some people say Manchester City Centre needs a truly 'wacky' public building in order to attract international attention. I'm not sure. THE MIDLAND HOTEL, now owned by Crowne Plaza and known as the Crowne Plaza Midland, is regarded as Manchester's most prestigious hotel. It's true, many VIP's and visiting dignitaries stay here, and it was the base for the 1998 In The City music convention. 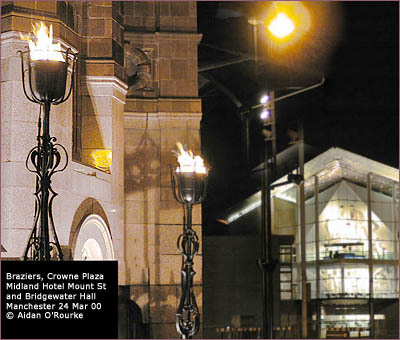 These gas-powered braziers were added during 1999 and are an eye-catching feature at night. It's nice to see real fire, rather than those imitation braziers at the Trafford Centre, which use an orange light, ribbons and a fan. Unlike the gas lamps of the 19th century, these braziers are self-igniting. 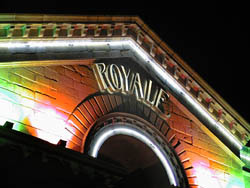 THE THEATRE ROYALE is located on Peter Street, next to the Free Trade Hall. This is Manchester's oldest and most distinguished theatre. Shakespeare can be seen on the front facade, leaning on one elbow. In 1927 it fell from grace and became a cinema - a use which continued well into the post-war years - I saw Dr Doolittle and 2001 a Space Odyssey there as a child. After that it became a bingo hall. Now it's the Discotheque Royale - I'm sure architects Irwin and Chester would turn in their graves if they saw the masses of Sharon's and Darren's gyrating to loud music and swilling vodka and Red Bull or endless pints of lager. And Eyewitness in Manchester has to confess that he once had a heavy night out here one time, and he wasn't imbibing the eternal spirit of The Bard. GRANADA STUDIOS TOUR is a major tourist attraction in Manchester, though I personally think it's over-rated and over-priced. The tour is not of Granada Studios themselves, but of a purpose built exhibition area. Visitors do get to see the set of Coronation Street, however. At night, the main entrance looks great, with the American style neon signs. 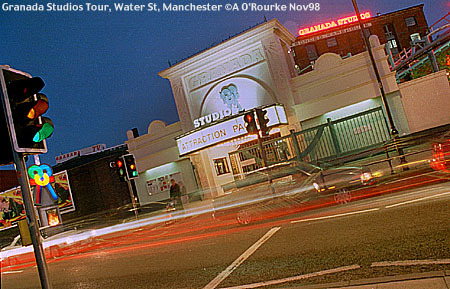 In 1999, the attraction was closed for redevelopment - I wonder what the newly revamped Granada Studios Tour will be like and if it will live up to expectations. LAS VEGAS LANCASHIRE, can be experienced at Granada Studios Tour, in city centre Manchester. This sign, along with others, looks to have been imported from the United States. We need more neon signs out on the streets of the city centre. 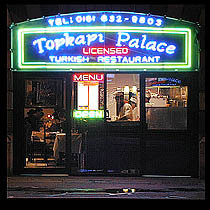 This is the Topkapi restaurant on Deansgate. 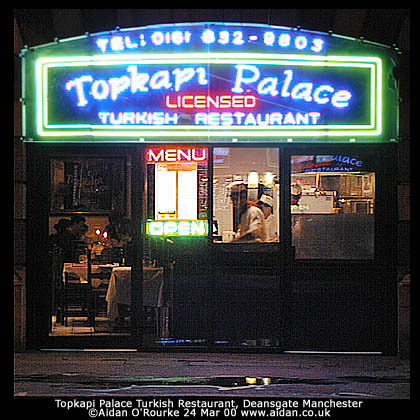 The original Topkapi restaurant was quoted by music guru and broadcaster Tony Wilson as one of his top ten favourite restaurants in Manchester. THE VICTORIA FOUNTAIN was officially re-opened in June 1997, when I took this photograph. First installed in 1897, it was removed in the 1920's and languished in Heaton Park until restoration in the nineteen-nineties. Just beyond it to the left is Cross Street. 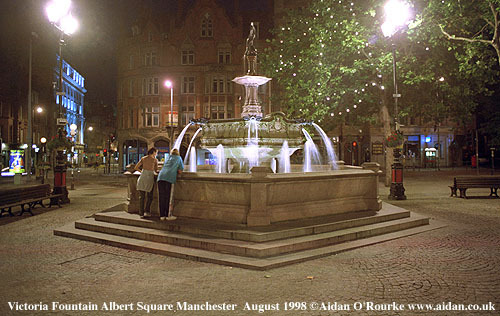 Albert Square has been a pedestrianised area since the 1970's, so the setting of the fountain looks different today from what it was in 1897. 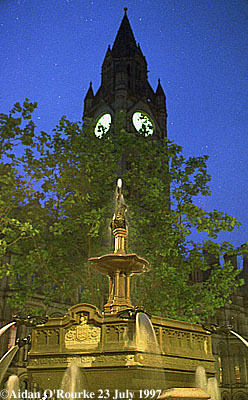 WE ARE LOOKING UP AT THE VICTORIA FOUNTAIN and beyond it, the clock tower of Manchester Town Hall on Albert Square. This is one of the earliest photographs in Eyewitness in Manchester, taken in December 1996, but the scene has remained unchanged in the intervening years. Albert Square is filled with the reverent atmosphere and stern values of the Victorian era. The Town Hall is a recreation of the Gothic architecture of the Middle Ages and the magnificent town halls of medieval Flanders. This character is perhaps more noticeable at night, when the square is quiet and empty, than by day, when it is filled with traffic and people. NIGHT TIME MANCHESTER at the weekend is a place where you'll encounter lots and lots of young people on their way from or to some nightclub, cafe bar or pub. More often than not, they've had quite a lot to drink, like these three Irish girls. They asked me to take their picture, but I told them I'd already taken it and showed them on the digital camera monitor. The blurred outline is partly because of the long exposure and partly because the subjects are rather unsteady on their feet. 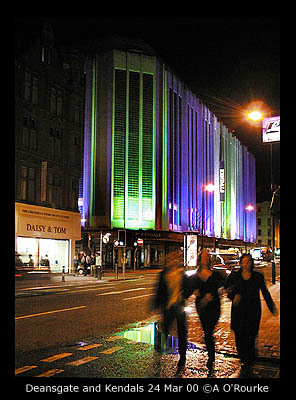 Behind, we see the attractively floodlit facade of Kendals department store, opened in 1939. 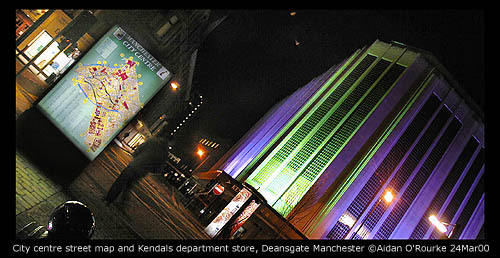 AN ILLUMINATED CITY CENTRE MAP and Kendals department store, are seen here at night from the end of King Street, looking across Deansgate. These maps, put up by the local authority, Manchester City Council, differ from the previous ones in that they have included the university district to the south east. Kendals still looks sleek and ultra-modern, with its groovy floodlighting, even though it was built in the year that World War Two broke out. 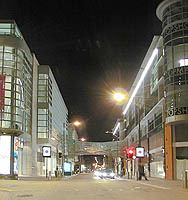 THIS IS THE NEW CORPORATION STREET at night. On the left is the new Marks & Spencer store, looking like an airport terminal building. On the right is the redesigned facade of the Arndale Centre. The yellow ochre tiles have been replaced by brown brick, metal and lots of glass, with cylindrical corner towers. The two buildings are linked by the futuristic new footbridge - like the Arndale Centre closed outside shop opening hours. Just under the bridge is the Victorian post box which withstood the full force of the IRA bomb, which exploded on 15 June 1996. It's amazing to think that this futuristic new street has taken shape in only a couple of years. 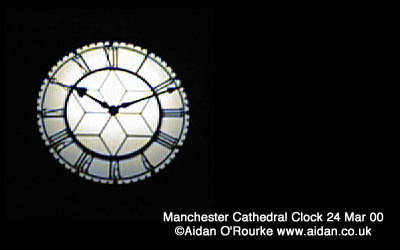 MANCHESTER CATHEDRAL is dark at night - at the moment (Summer 2000), there is no floodlighting. I assume that when work is completed in the cathedral area, it will be lit up at night. So for the time being, the clock face is the only part of the Cathedral that's relatively bright at night and visible to the digital camera. The glass clock face was badly damaged by the IRA bomb of 1996, but here we see it restored to pristine condition and - checking the time on my mobile phone - I see it's correct. 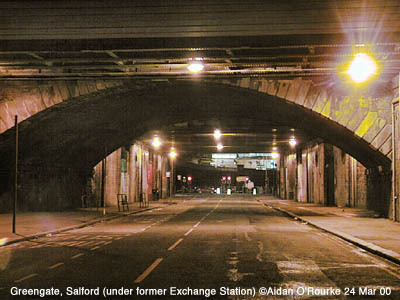 WANDERING down the back streets, and under the old railway viaducts of Manchester, we get a strong feeling of the 19th century, when this drab and depressing, but atmospheric, urban landscape was created. Above this bridge is the former Exchange Station - closed in 1969 and demolished, the platforms are now used as a car park. Buses from Salford used to terminate in this dark and dreary place - Nowadays people walk along here from the MEN Arena to return to their cars, which they've left in a private car park just around the corner. WE CAN SEE 'OLD' MANCHESTER in this photograph, taken on Collyhurst Road, next to the railway viaduct leading to Victoria Station. Charter Street Ragged School is just under the bridge on the right, and through the centre left bridge is St Michael's flags, next to where the church of the same name used to stand. I've changed the colour of the lights from the orange of contemporary street lamps to the dim blue of the ones I remember from before the 1970's. At night, this area is laden with the atmosphere of the 19th century. People used to live in back to back terraced houses in the side streets very close to here. They were some of Manchester's worst slums and were pulled down in the 1930's. I hope this area remains as it is, a grim but atmospheric reminder of Manchester as it was until quite recently. THAT CONCLUDES our walk around the seedier parts of nighttime Manchester. For another Eyewitness update, I'll take a more conventional view, and focus on the livelier parts of the city at night, and perhaps taking a look outside and inside some of the night clubs - accompanied by two bodyguards I think. The next update will follow soon.